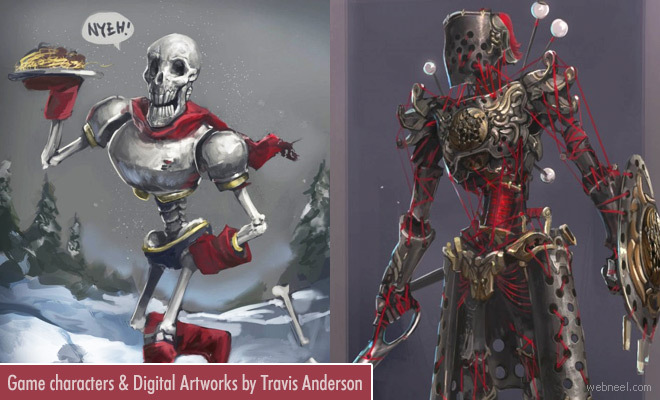 Digital Painting : Travis Anderson is a 21 year old freelance illustrator and artist from Canada. He loves to create game character designs which are simply stunning. Each of the digital paintings have a special story towards them which makes it very interesting. The seamstress is a very old person made of wax and she holds one of the oldest threads which she uses to create the dresses. She needs constant heat to keep her body intact and she is not a human model and definitely not for the faint-hearted. He has also created several more characters using the thread like tangled knight, seam ripper, embroider and others. His game characters design are a pleasure to watch and he constantly updates his work on his facebook page.